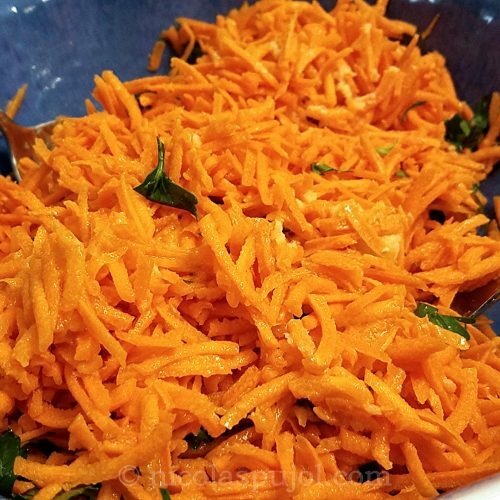 As a kid, my mother would make carrot salads often. 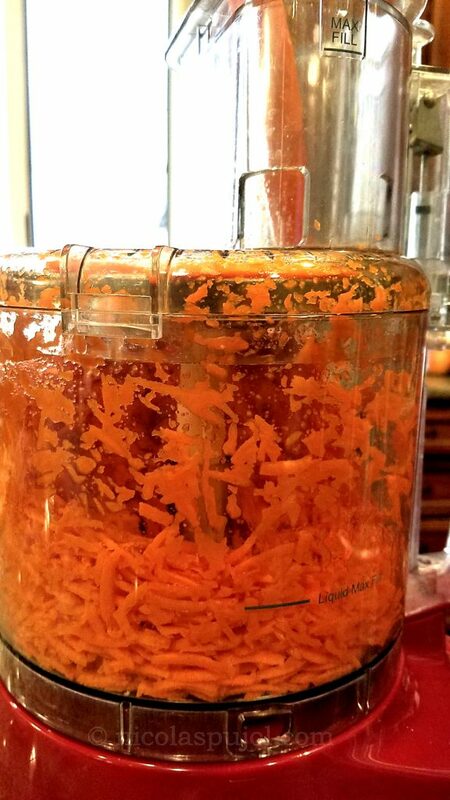 We did not have an electric food processor, just a basic mixer, and she should grate the carrots by hand. She made the sauces mostly using lemon and olive oil, and some garlic. 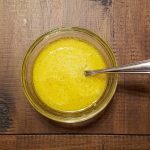 Sometimes, she would use vinegar instead of lemon, as is the case for French salad dressings. The salads tasted good, but like every young child I occasionally needed some convincing. So she would explain that carrots contain vitamin A, which is good for the eyes and for sight, among other things. When she said this, I ate some of these carrots and concentrated deeply, looking at some far-away object to see if it would make a difference in vision. I had no idea that things like this take time to get better and to get worse. I thought that as soon as I swallowed these carrots, I would get some kind of superman vision — the things a kid can imagine at the age of 5. I believe in a balance between cooked and raw food. Both have their advantages and disadvantages. Cooked foods contain much fewer bacteria due to the elevated temperatures which eliminate most of them. Cooked food tends to also more easily digestible, allowing us to absorb more of the calories. 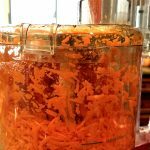 The downside is that some vitamins may be lost in the cooking process, and eating fresh foods that are alive also help keep our immune system strong. This is the notion that makes probiotics relevant. 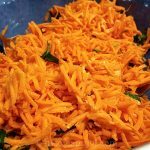 For this salad the carrots are peeled and washed well, and the lemon dressing contains acidity, which should make it quite easy to eat while still keeping all the vitamins intact. 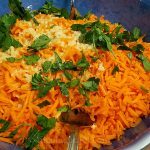 The salad goes well as an appetizer, a first course in a meal, or as a side for a warmer dish. 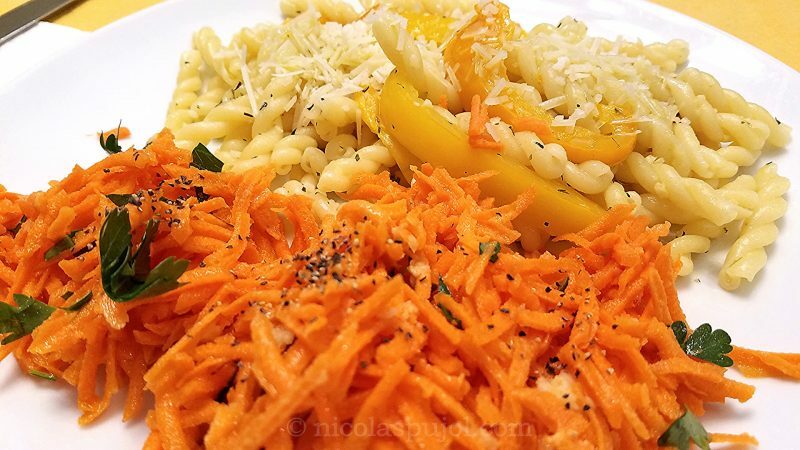 This week, we enjoyed it with pastas and sauteed bell peppers. 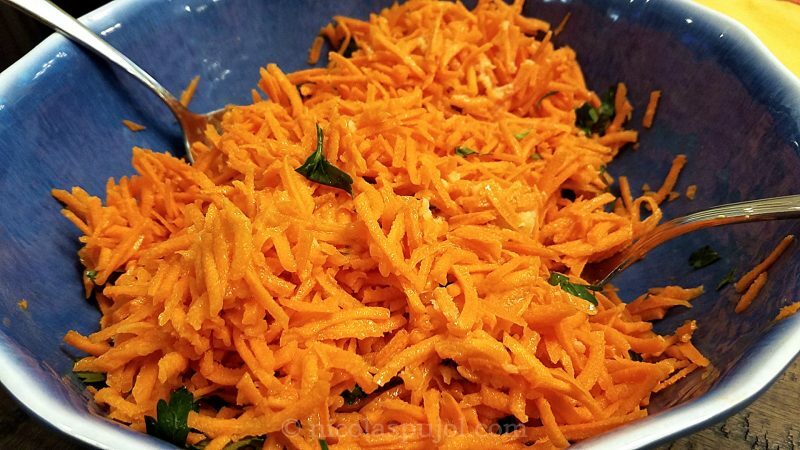 Peel the carrots, rinse them well, cut the edges and grate them in a food processor or by hand using a grater. Make the French lemon dressing and pour it on top. Add the cilantro or parley.